Origin and Habitat: A very wide-spread species, known from areas of the Amazon basin in Columbia, Peru and Brazil as well as some coastal rivers in Suriname. Occurs in rivers, streams, pools and flooded forest habitat; in coastal rivers, it will never venture into saltwater. Compatibility/Temperament: Very peaceful bottom fish, well suited to any community aquarium of non-aggressive fishes. Must be kept in a group, preferably five or more. A group of three can be kept with other cory species. In its habit, feeds on worms, crustaceans, insect larvae. Readily accepts prepared foods that sink such as tablet and pellet; frozen bloodworms and live worms are relished as treats. Soft (hardness up to 12 dGH) acidic to very slightly basic (pH to 7.2) water, temperature 22-26C/72-78F but not warmer. This is one of four very similarly-patterned corys that are frequently confused and will often be seen in stores under incorrect names. 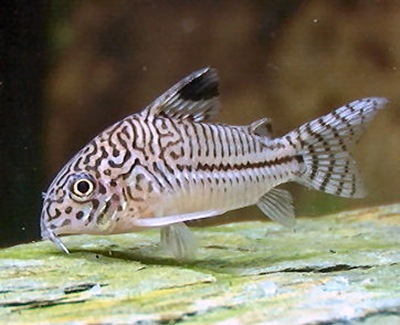 Corydoras julii, C. leopardus, C. punctatus and C. trilineatus all share a large black blotch in the dorsal fin, a barred caudal fin, and a horizontal stripe along the body at the juncture of the dorsal and ventral lateral plates; the body is spotted. However, all these species are highly variable in their pattern, as is evident in the two photos of the subject species below. The subject species is very often incorrectly labeled as C. julii in stores and the majority of "julii" corys sold are actually C. trilineatus. The subject species usually has a reticulated head pattern and the body markings are more variable than C. julii which always has a spotted head and body and is somewhat smaller and more compact-looking in size. The aquarium should be well-planted with pieces of bogwood, a dark substrate (small gravel or sand, provided it is smooth-edged) with some open areas; like most other cory species, this one does not appreciate bright lighting. This species likes to spend time under cover or among plants. Females are rounder when viewed from above. This species is easier to spawn than many corys, and coupled with this fish's hardiness and attractive patterning, makes it a good beginner's cory. 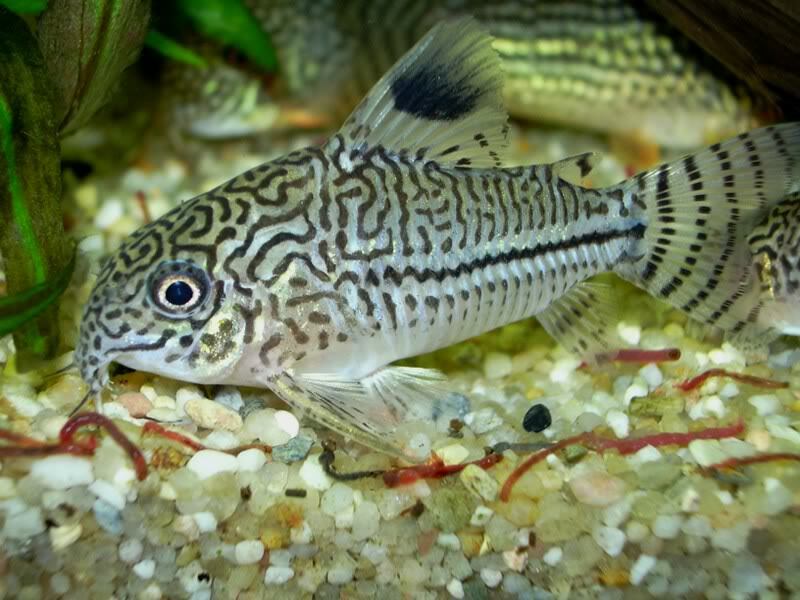 The Corydoras are quite sensitive to water parameters and quality, and highly intolerant of salt, chemicals and medications. Signs of stress usually begin with rapid respiration, then lethargy (often just "sitting" on plant leaves, wood or the substrate respirating heavily, sometimes near the surface) and sometimes rolling onto one side. At such signs, a partial water change of at least 50% with a good water conditioner should immediately be made, and appropriate steps taken to remove the cause. Any sudden fluctuation in water chemistry or temperature often induces shock, causing the fish to "faint" and fall over on its side. Corydoras introduced to new aquaria will settle in better if the tank is established; corys do not adjust well to a new aquarium with still-unstable water conditions and fluctuations. The dorsal, pectoral and adipose fins are each preceded by a spine which is actually a hardened and modified ray; the pectoral fin spine can be "locked" into position by the fish; care must be taken when netting corys not to entangle these spines, which can also give the aquarist a nasty jab. They are believed to be a defense adaptation, to lodge the fish in the throat of a predator. All species in the genus will periodically and fairly regularly swim quickly to the surface for a gulp of air. The fish swallows the air and blood vessels in the hind gut extract oxygen from the air; it is then expelled through the vent the next time the fish breaks the surface for another gulp of air. This adaptation is believed to have evolved so that the fish can survive in poorly-oxygenated water such as drying pools during the dry season. It is however essential to the fish's well-being that it regularly swallows air. This species was described by E.D. Cope in 1872 and the Latin epithet means "three of a line" which refers to the two paler and middle black lines along the fish. The names C. episcopi [Eigenmann & Allen, 1942] and C. dubius [Nijssen & Isbrucker, 1967] were determined to be synonyms of C. trilineatus by Nijssen and Isbrucker (1980) and are now deemed invalid. The name of the genus, which was erected by B.G.E. Lacepede in 1803, is derived from the Greek cory [= helmet] and doras [= skin, incorrectly used here for "armour"]; it refers to the dual row of overlapping plates (instead of scales) along the body, comparable to a suit of armour. Last edited by TFK Team; 06-07-2013 at 04:40 PM.